"This result is important because the Intergovernmental Panel on Climate Change (IPCC)"—the UN science advisory body—"makes a very conservative projection of total sea level rise by the end of the century," at 60 to 90 centimetres (24 to 35 inches), said Peter Wadhams, a professor of ocean physics at the University of Oxford who did not take part in the research. "Yet there is convincing evidence—including accelerating losses of mass from Greenland and Antarctica—that the rate is actually increasing, and increasing exponentially." 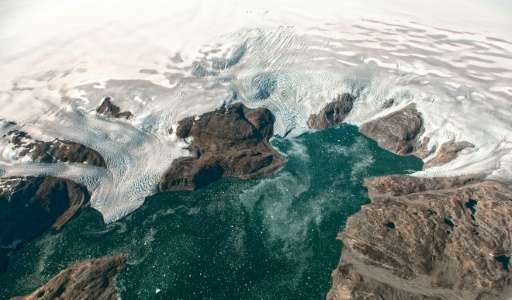 Greenland alone contains enough frozen water to lift oceans by about seven metres (23 feet), though experts disagree on the global warming threshold for irreversible melting, and how long that would take once set in motion. "Most scientists now expect total rise to be well over a metre by the end of the century," Wadhams said. The second was from satellite altimetry, which gauges heights on the Earth's surface from space. "We corrected for a small but significant bias in the first decade of the satellite record," co-author Xuebin Zhang, a professor at Qingdao National Laboratory of Marine Science and Technology in China's Shandong Province, told AFP. Overall, the pace of global average sea level rise went up from about 2.2 millimetres a year in 1993, to 3.3 millimetres a year two decades later. In the early 1990s, they found, thermal expansion accounted for fully half of the added millimetres. Two decades later, that figure was only 30 percent. "Even with decades of measurements, it is hard to be sure whether there has been a steady acceleration in the rate of global sea level rise during the satellite era because the change is so small," he said. 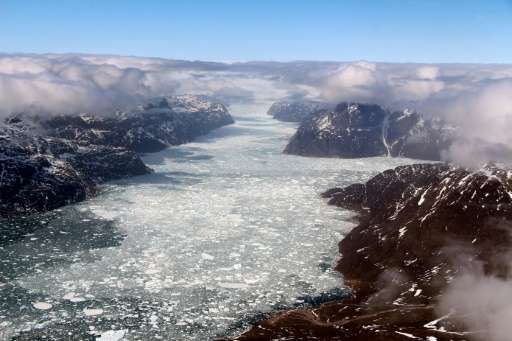 Disentangling single sources—such as the massive chunk of ice atop Greenland—is even harder. "This is a major warning about the dangers of a sea level rise that will continue for many centuries, even after global warming is stopped," said Brian Hoskins, chair of the Grantham Institute at Imperial College London. Nonsense. Did they correlate it with tide gauge data which shows no such acceleration? If they didn't then they didn't actually find a "small but significant bias" in the early satellite record. They found nothing. In fact, what the tide gauge and satellite data both show is that there is no statistically significant acceleration in the record, certainly none that can be attributed to human causes. The Church & White study notes that the linear trend is relatively steady over the 140 year record with short, significant departures (the rate increases or decreases briefly and sea levels even went down over a 5-year period starting in 1962). So far there is no evidence of a significant increase in the rate of sea level rise, contrary to the hopes of the alarmists. The Avg. sea level has been rising since then end of the Younger Dryas. Worry about meters not millimeters. The sea may continue rising until the poles are ice free (as they have been in the past) or the next glaciation may start tomorrow. After all, the climate changes. When people say something is "rising exponentially" they are making a mathematical statement that in this case is ludicrous. If sea levels were truly rising exponentially, we could expect to see a water world with no land area at all in a few hundred years. Much more accurate would be to say that sea level rises are accelerating. That is, showing a polynomial function in their increase rather than a strictly linear one. However, the rates of sea level increase is much easier to measure in modern times, because scientists have developed much more refined methods to accurately measure it both directly (using sound propagation rates that are very sensitive to temperature) and using satellites (less accurate but more history). There is considerable variability in the rate of rise during the twentieth century but there has been a statistically significant acceleration since 1880 and 1900 of 0.009 ± 0.003 mm year−2 and 0.009 ± 0.004 mm year−2, respectively. When people say something is "rising exponentially" they are making a mathematical statement that in this case is ludicrous. I am surprised that you continue to post your anti-science denialist drivel in a site where 95% of the people reading it full well realize that you are expressing confirmation of your complete ignorance on the subject. I suspect you would do much better posting someplace where the average scientific literacy level is far less, say, a political or religious site. If readers are seeing far into climate's future it is because they are standing on the shoulders of a giant political movement. That's C&W 2011. They say "since 1880 and 1900" because their data showed statistically INSIGNIFICANT sea-level rise acceleration since the 1920s. Even by including data before the 1920s they only found 0.009 mm/yr^2, which is negligibly tiny. PLUS, the C&W 2006 data ("A 20th Century Acceleration in Global Sea-Level Rise") actually showed DECELERATION after the 1920s. PLUS, C&W's 2009 data showed DECELERATION even for the entire 20th century -- so they didn't publish a paper on it! ncdave4life - I quoted directly from the link that aksdad provided. The wording is very clear. Now you are saying there was 'deceleration.' But you provide no link. The overall situation is clear. During the 20th century - rise was around 1.8 mm per year. Today it is around 3 mm per year. https://www.clima...ea-level Stop obfuscating. DEFINITION "exponentially": Relating to a mathematical expression containing one or more exponents. Something is said to increase or decrease exponentially if its rate of change must be expressed using exponents. A graph of such a rate would appear not as a straight line, but as a curve that continually becomes steeper or shallower. "Even with decades of measurements, it is hard to be sure whether there has been a steady acceleration in the rate of global sea level rise during the satellite era because the change is so small." Just love the way these alarmists try to use their personal interpretations of mathematical terminology to scare people into thinking we should presently be living in a static environment that has never been static in the past. One problem with tide gauges is that they are in fixed locations next to land. The average sea level is not the same as the sea level at any given place; it is in fact distributed unevenly across the globe. Changes in gravity (the mass of the ice sheets being redistributed to the ocean) and other forces necessarily cause the sea to rise at different rates in different places. I think I read that Japan will see higher increases than California. Another problem is you're looking at data collected by many different people with different standards and equipment over more than a hundred years. The data has to be examined and corrected. What is with you guys all denying basic physics and chemistry, anyway? If you add CO2 to the atmosphere, it must trap more heat; if you heat water, it must expand; if you dissolve CO2 to water, it must become more acidic. All of that is inescapable, and the consequences are obvious to anyone whose mind is not closed off by fossil fuel propaganda.